Children learn at their own pace and follow their own individual interests. 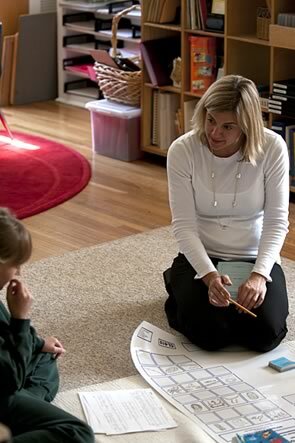 Children learn from a set curriculum according to a time-frame that is the same for everyone. Uninterrupted work cycles Block time, period lessons. Children teach themselves, using materials specially prepared for that purpose. Children are taught by the teacher. Learning is based on the fact that physical exploration and cognition are linked. Children sit at desks and learn from a whiteboard and worksheets. The teacher works in collaboration with the children. The class is teacher led. The child’s individual development brings its own reward and therefore motivation. Motivation is achieved by a system of rewards and punishments. Understanding comes through the child’s own experiences via the materials and the promotion of children’s ability to find things out for themselves. Learning is based on subjects and is limited to what is given.